Ok I know I said in the beginning that I was going to get Adam to take the pictures instead of taking the crappy iPhone pics. Turns out though that Adam is never home and I never have on make up, so cutting the head out is what you're going to have to get. 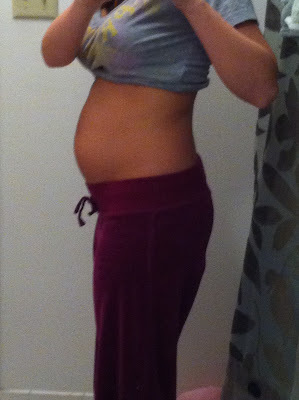 Total weight gain/loss: At our appointment last Monday they said I have gained a total of 5 pounds. Maternity clothes? No, but any day now! I am limited to a few work pants now. I think I smell a shopping trip soon! Stretch marks? None! I'm hoping that all of the body butter I've been applying will do it's job! Best moment this week: I always enjoy our doctor appointments, especially when we don't have to wait too long to go back! This time the heart rate was 158, so it's still in the "girl range" if you believe that myth. Movement: Ok I am like 73.6 % sure I felt it kick the other night. But at this point I just still convince myself it's not the kid, just "the other thing"....alrighty then. Food cravings: Five Guys french fries dipped in the malt vinegar. And Fudgesicles. Gender: Not sure yet, we find out Feb. 14th! What I miss: I'm not gonna lie, the tanning bed. What I am looking forward to: Valentine's Day! I sure hope Adam doesn't forget that it is in fact Valentine's Day, because I love presents!! Although, I would be reallly happy if he just took me to Cypress Inn...or Taco Bell. I'm not too picky. Weekly Wisdom: Pregnancy Brain DOES exist. Example: Last week I got in the shower with my socks and underwear still on. Milestones: You know, I'm not even sure anymore. I mean, I cooked dinner the other night, and that seems to have been a huge milestone considering it doesn't happen very often anymore. hahah Annie says she misses the tanning bed too... no shame in that. I want some five guys fries now. You look adorable! Check out us.asos.com for cute maternity clothes...I LOVE their stuff!